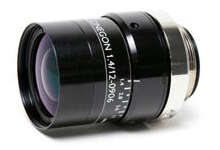 This 2/3" compact lens is optically corrected and broadband coated for the spectral range of 400 - 1000 nm. It can image properly across the entire range without any focus shifts. This lens is focused by rotating the main lens barrel, then locked down using the Allen screw on the collar. The infinitely adjustable iris has a large thumbscrew. These features assure long-term stability, even in typical production environments. Contact us for info on ruggedized and "high-end 3D" versions.